Mutahida Quomi Movement (MQM) was Muhjir Quomi Movement when it was first formed in 1984 by Altaf Hussain and his companions .The cause and purpose behind the MQM making was racial and lingual. Altaf Hussain and his companions had a view that the Urdu speaking, the largest community of Karachi populace had been badly ignored and side lined in all spheres of life. His apprehensions were quite justified but the way he adopted for the acquisition of those rights was insane and irrational. He very quickly resorted his organization towards carnage, terror and force. It is blamed that the General Zia was behind the idea of surfacing MQM to suppress Pakistan Peoples Party (PPP) to minimize and reduce its pressure on his government which hanged its leader and sitting prime minister of the country of that time when the former dethroned him and occupied on latter government by imposing Martial law. Altaf Hussain in the very beginning of his politics has the slogan “Karachi is ours”. Altaf Hussain fiery speeches added fuel to fire in Muhajir confrontation with other ethnic communities; Pashtons, Sindhis and Punjabis. In 1985, Mohajir-Pashton clashes deprived dozens of innocent people from their lives .This divided Karachi deeply on racial, ethnic and lingual basis. In 1991 Altaf Hussain shifted to Britain because of severe cases of killing, kidnapping and harassment against him. Since then he has been handling party affairs from London secretariat. His long hours contained fiery speeches started broadcasting on air since the private media inception in Pakistan. In his speeches, he most often used very rubbish and rude language for his political opponents, national institutions, and his heads, even on different occasions he declared the establishment a historical blunder. His speeches were quite enough to bring all the ethnic communities of Karachi to confrontation and most often to the bloodshed. In 1993, Mian Nawaz Government launched Karachi operation because of the deteriorating situation of the economical hub of Pakistan. The beheaded, wounded and tortured bodies of opponent political workers had been recovered from various parts of Karachi. The fear and horror atmosphere was created. The investors started fleeing from Karachi. The operation by Pak Army and Police disclosed and unveiled drastic mysteries. As there were number of torture cells of the party established for the opponent parties political workers. There were maps of Jinahpur. Again in 1993, Banazir Government launched such an operation and it again restored Karachi peace. But General Musharaf so called democratic government needed MQM votes after 2002 elections fallout. It gave again the party all concessions and fullfilled all its unfair demands, even accepting a person for Sindh Governorship who was escaped from country and had six cases of killing against him. 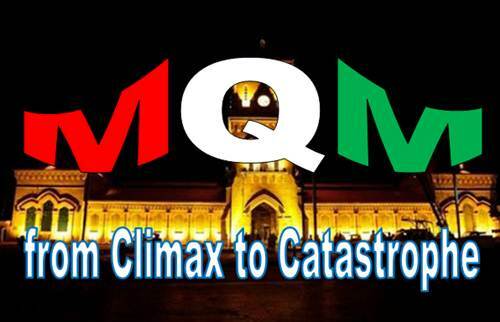 The new courtship and honeymoon of establishment and MQM reached on its peak in this government. When in May 2007, former suspended Chief Justice Supreme Court intended to visit Karachi on his Judiciary restoration campaign. MQM tried to stop him by force on the dictation of Pervez Musharraf. It resulted the loss of 48 innocent people lives who were there to receive Chief Justice. Altaf Hussain came forth in the persona of a Don of films, his single speech was quite enough to destabilize Karachi’s peace and routine life in seconds. Then there started a series of violence of target killing, burning public transport and closing the city. Karachi which once upon a time was the centre and hub of country’s flourishing economy and investment came to a static position. All the investors fled away from here to Dubai and Malaysia because of city’s day by day worsening situation and the threats to their lives. At last the Supreme Court had to take notice of his anti state and institutions speeches and ordered of its ban on air telecast. The former Secretary General of MQM Dr. Imran Farooq assassination in London in 2010 and money laundering cases launched by Scotland Yard weakened Altaf position more. The Rangers operations by Nawaz Government in 2013 and Altaf’s speeches added fuel to fire and it reached the establishment on a conclusion to separate MQM from Altaf Hussain and to free the Muhajir community from its slavery and bloody claws, making MQM an organization led by the leadership present in Karachi not in London. Although the Establishment succeeded in its designs to separate MQM from Altaf Hussain but the organization couldn’t sustain its strong and sound base as it used to be in the autocratic leadership of its founder Altaf Hussain. Just in a period of one and half year, it scattered and divided in different groups like MQM [London], MQM [PIB Colony], MQM [Bhadurabad], Pak Sarzameen Party [PSP], resulted in worst defeat in Senate election when the party could win only a single seat instead of four because of its MPAs betrayal with party. It signified the party leadership weak grasp on party legislators, totally contradictory to what used to be in the leadership of Altaf Hussain. Now the MQM MPAs of both groups are leaving party on daily basis joining Pak Sarzameen Party [PSP] taking MQM Pakistan to its logical end for the first time in its 34 years history, giving birth of new trends in Karachi politics. Disclaimer: The views and opinions expressed in this article are those of the authors. The editor of this website may not necessarily agree with the facts and opinions presented in this article.